Heading into the Voice Festival Weekend was a manic blur. With Suspensions jetting in from across the globe, our perennial organisational monarch Rafaella Barratt had a mammoth task in ensuring our collective arrival at Hampton School, but we made it and (lack of sleep notwithstanding) arrived in high spirits. Our group had competed in the Voice Festival once before, last year in our first year as an ensemble, and it was a thunderously eye-opening experience that reinvented the way we all approached a cappella. The talent of all the other groups inspired us all to work our noggins off to push the boundaries ever harder regarding our arrangements, our choreography, our performance and even our dynamics – as insisted by our MDs! We wanted nothing more than to deliver on the standard present at the University Competition that had been such a showcase of diverse, kickass talent in 2015. This year was no different – the Sweet Nothings sizzled sass, Aquapella delivered on their reputation for next-level musicality, RadioOctave dropped musical puns and swag, and our Bristol-based buddies Pitch Fight made their VoiceFest debut and absolutely rocked our socks off. The Rolling Tones also provided a personal highlight with a stellar arrangement of Nancy Sinatra’s ‘Bang Bang’ (if you haven’t watched it, watch it). 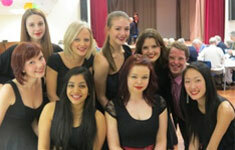 Our group had competed in the Voice Festival once before, last year in our first year as an ensemble. It was a thunderously eye-opening experience that reinvented the way we all approached a cappella. The talent of all the other groups inspired us all to work our noggins off to push the boundaries ever harder regarding our arrangements, our choreography, our performance and even our dynamics – as insisted by our MDs! We wanted nothing more than to deliver on the standard present at the University Competition that had been such a showcase of diverse, kickass talent in 2015. The calibre of the competing groups was just as immense as we’d remembered, and we were thrilled to share a stage with so many groups that all had a unique style to bring. Being surrounded by such talent is a surreal experience, but we entered into the whole affair with a group mentality of aiming for enjoyment rather than victory. We knew that this would help settle the nerves and make it easier to convey our own goofy brand of humour. To have made it through the video auditions stage was a privilege in itself so we weren’t too stressed out by expectation. For our semi-final set we had decided on one of our favourite pieces of the year, a comedic mash-up of ‘I Want You Back’ and ‘Trouble’ arranged by one of our two MDs, Joe Pickin. This featured alongside one of our more experimental and recent additions to our repertoire, a medley of ‘Everything Everything’ numbers arranged by myself and our criminally modest beatboxer, Scott. The hope was that the two arrangements would offset each other nicely and convey our ability to be both humorous and serious, although our decision not to perform any rendition of ‘How Deep Is Your Love’ had us feeling very left out! Our progression to the finals was utterly unanticipated, and had us all absolutely giddy and gleeful. We leapt into the ‘aca-challenge’ with enthusiasm and had to rein in our joy and pride to avoid partying the night away, as we’d unexpectedly found that we had to save our voices for another stage of competition! We spent the following morning reclaiming our relaxed team environment by attending the various workshops and round table talks on offer at the festival. The choreo workshop especially highlighted the dazzling potential of certain group members. It’s all in the smile. Our last efforts were spent polishing our overall set, with the final addition of ‘Madness/Magic’ an arrangement the group had fallen in love with and the magnum opus of our other MD, Aliak Bedirian. It was the last piece of the puzzle that was our attempt to perform with a broad range of emotions, and sounded pretty neat too. Evidently it came across, as, in some wacky fairy tale twist ending, we were immensely privileged to be announced as the champions. We also achieved awards for beatboxing and choreography and a beatboxing battle trophy along the way (to add to Scott’s list of achievements to humbly downplay). We were so surprised and elated that, with true Bristol Suspensions class, we could only flop about the stage screaming like schoolchildren. We’d aimed only to have as enjoyable a weekend as possible, and ended up with an honour that blew our minds. Objective achieved. With one last teary and bizarrely up-tempo encore performance of Madness/Magic, the competition was over, and we quickly elected to celebrate long past the early hours. A little too much cider and a little too much Singstar – the Bristol way. Amidst the revelry, a lot of pride was felt over our newest soprano, Eleanor, who made her debut as a group member at the event, as well as our MDs for all their hard work bearing fruit in such a positive way. The result validated the long hours of dedication, and that made us all feel absolutely on top of the world! We’re completely indebted to the VF-UK team for delivering on such an entertaining and informative weekend. We’re so grateful for what we’ve achieved. Meeting and singing alongside other a cappella groups continues to be the highlight of such endeavours, and VF-UK is such an opportunity to get to know others, not to mention how useful and enjoyable the various workshops were. We had a blast. But for now, thank you to VF-UK and all the other groups for a fantastic weekend. The Bristol Suspensions can’t wait to see what the next year has in store! 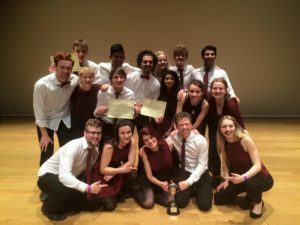 This entry was posted in University Programme and tagged a cappella, a cappella champions, festival weekend, university champions, vf-uk champions by Beth Whalley. Bookmark the permalink.